The JU 52 was designed as an airliner, similar to the DC 3's role and it was quite successful. During the war the JU 52 became the standard transport and was used throughout the war on every scene. Some have been build after the war in Spain (Casa) and France (Amiot). It had a crew of 3 and seated 17 passengers. Vickers Super VC-10, G-ASGC (c/n 853) at Duxford's Imperial War Museum on 02Jun03. 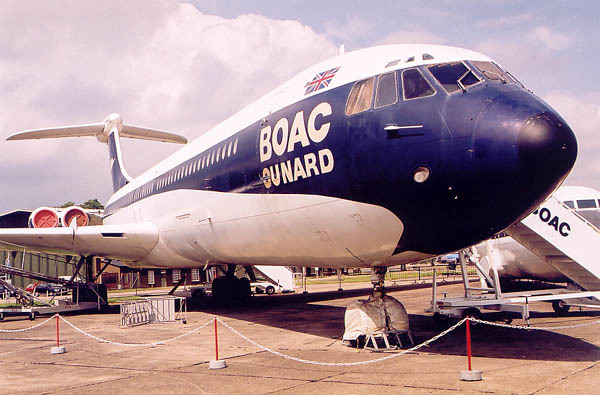 During the first six months of BOAC Super VC-10 operations (in 1965) the aircraft did fly some transatlantic services for BOAC-Cunard Limited. BOAC-Cunard had been formed in 1962 as a joint venture between the two companies. Cunard was the famous UK shipping line that operated the Queen Elizabeth and Queen Mary liners on the Southampton-New York route. At the time Cunard owned Eagle Airways, which traded under the name Cunard Eagle Airways, and BOAC regarded that company as a threat since it was operating in direct competition from New York to Bermuda and also wanted to fly scheduled transatlantic services. To remove this competition BOAC secretly negotiated with Cunard and a new airline, BOAC-Cunard, was formed to operate the transatlantic routes. These services were initially flown by Boeing 707s, but during 1965 the Super VC-10s also joined in carrying the BOAC-Cunard logo instead of the BOAC titlles on the forward lower fuselage. The Super VC-10s commitment to BOAC-Cunard seems to have amounted to a five times weekly service to Boston and Detroit, and a three times weekly schedule to Lima. In October 1966 BOAC bought out the 30% shareholding which Cunard held in the company and its activities were then transferred to BOAC. Vickers VC-10 1101 G-ARVM (815) at RAF Museum Cosford, preserved in "British Airways" colourscheme and titles. On July 8, 1964 G-ARVM made its first flight from the Weybridge runway, looking smart in the 'Golden Speedbird' scheme which was then the current paint scheme for BOAC VC10s. Entering service not long after, -VM was soon earning its keep on the different routes that the VC10 serviced in those days. Pilot training on the VC10 was usually carried out in Prestwick. Up there pilots converting to the type could practice take offs, standard approaches, and especially circling approaches. On the airfields in Africa, in those days, an NDB was a luxury, and therefore many approaches could only be flown towards one end of the runway, necessitating a visual circuit below the cloud ceiling after the instrument approach if the wind was blowing in the wrong direction. At some point during its career -VM ended up as the preferred training aircraft, and could often be found at Prestwick to train the new and also the experienced pilots that came over for some practice. When the Bloeing 747s were ordered by BA, the days for the VC-10 fleet were numbered. G-ARVM flew on for several years as a standby aircraft for the Super VC10 fleet. In 1979 the Super VC10s were also nearing the end of their BA career, and because of this G-ARVM was now also due for retirement. In October 1979 she made her last flight to RAF Cosford, where she was preserved in the 'British Airways' collection at the RAF Museum, joining other famous airliners at the site. "The VC10 G-ARVM has now been restored at Brooklands Museum (fuselage only) in time to celebrate VC10 50th anniversary this Friday." G-ARPH Trident 1C (c/n 2108) at RAF Museum, Cosford 30May03. Designed by De Havilland, but produced by Hawker Siddeley Aviation (upon the merger of De Havilland and several other UK companies). The Trident 1C had its first flight on 9th January 1962. BEA's order was for 24 aircraft and the first one (the original prototype) entered service on 1st April 1964. By 1965 there were 15 Tridents in the fleet and by March 1966 this had risen to 21. BEA and BOAC merged to British Airways in 1974. 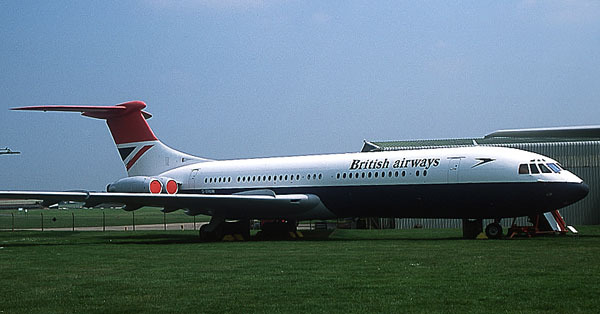 Trident versions (1C, 2E, 3B) were flown until the 1980s by BA. 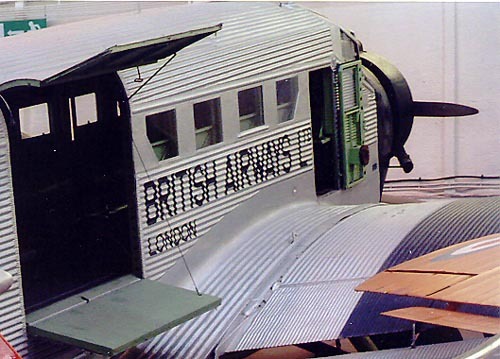 British Airways was at some point just "British", the period is unknown to me. 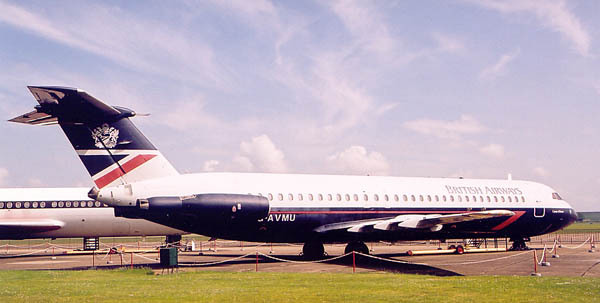 BAC 1-11 510ED, registration G-AVMU (c/n 148) at Duxford (02Jun03). 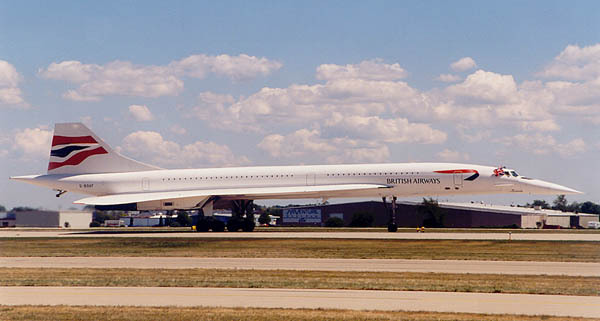 I don't know whether this colourscheme was introduced during the same time (1985) as the livery shown below on the Concorde; the dark blue underside may not have looked good on the sleek Concorde. Concorde 102 G-BOAF (216) in approach for runway 19R at Amsterdam IAP... quite a unique thing ! After a British Airtours 737 crash at Manchester on 22Aug85 and the resulting inspections, BA was SO VERY short on short-haul aircraft and thus decided to combine some London-Amsterdam flights into this Concorde flight! I can imagine the surprise of the passengers when they boarded ! "The Concorde had to be primarily white because of its speed; it therefore had the different livery." During 2003 both Air France as well as British Airways decided to ground the Concorde. BA's Concorde took to the skies on October 24 for its last-ever passenger flight, sending the world's only supersonic airliner flying into the history books after 27 years of shuttling the rich and rushed across the Atlantic at twice the speed of sound. The end came during the afternoon when three BA Concordes landed at Heathrow airport on the Western edge of London, the last of which being the invitation-only flight from New York. Air France had already ceased flying the Concorde ahead of BA. The end of an era. G-BOAF was the last Concorde to take off from Heathrow, went supersonic over the Bay of Biscay and landed again as "BA9022C", ready for its retirement at Bristol-Filton, with total hours 18.255 and 6044 cycles on the airframe (24Oct03). Information courtesy Aviation Letter no.444. 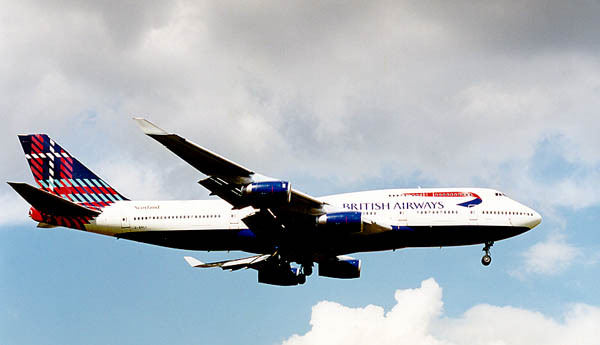 Quite an unconvential step was made by British Airways when they introduced "World Tails" in 1998.... An uproar was the result because BA had changed from "flying the flag" to an artist impression representing the various countries in the world. Personally I liked it very much, but many more conservative thought it an outrage. As many of these discontented people proved to be influential, the decision was made in 1999 not to proceed with the colored tails and to reintroduce a stylised version of the Union Jack-flag. Around 2003 the colored tails were becoming fairly rare. 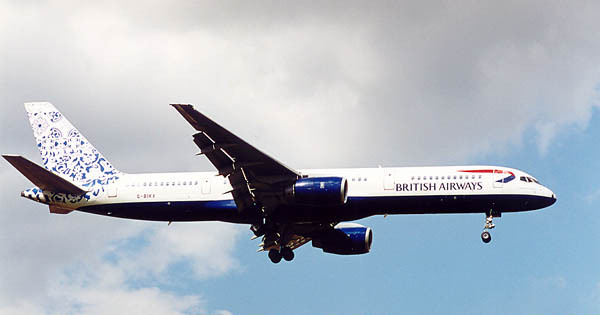 The artist impression on G-BNLI was called "Benyhone Tartan". Beoing 757-236 G-CPEV (29943/871), SPL 25May02. This "World Tail" is called "Rendezvous". I think there were about 30 impressions, too much culture for some. Boeing 757-236 G-BIKX (23493/90), LHR 22Aug00. As a Dutchman I am proud to recognize this impression as "Delftblue Daybreak". 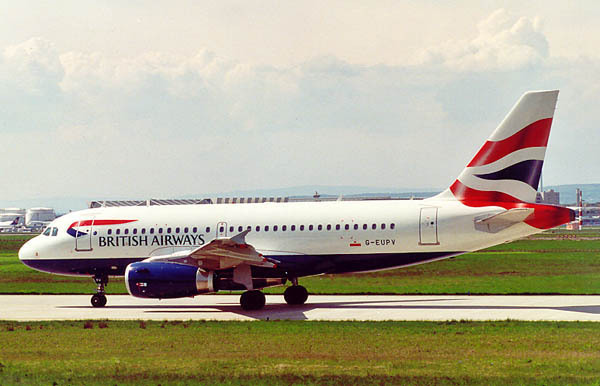 Airbus A319 G-EUPV (1423) at Frankfurt 01May01 with the "Union Jack" painted back on. The way it is painted now is again very conservative, but in business the majority don't like to rock the boat and of course the customer is always right ! The modified "speedbird" insigna remained the way it was.